NASA enjoys the stablest budget in the Federal government. Why then its continual state of disarray? With Monday’s release of the FY12 President’s budget request, I decided to update the interactive sand charts of Federal budget outlays previously posted to IBM’s ManyEyes site. This time I’ve included not only spending from 1962-present in inflation adjusted 2010 dollars, but also the slightly more meaningful charts of spending as a percent of Gross Domestic Product. Explore a live visualization of 50 years of Federal spending. It took quite a while, but I finally finished This New Ocean. While not perfect, it was an enjoyable read. The book covers the period from the beginning of rocketry through its date of publication (1999). It’s major and significant strengths are that it includes a very good treatment of international efforts in space, not just U.S., and especially in the early years; and that it covers not just civil but defense and security space. These domains are not often found under one cover. Structurally, This New Ocean spends about 1/3 “pre-Apollo”, 1/3 covering the sixties, and 1/3 for everything thereafter. This is perhaps its greatest weakness: readers motivated enough to tackle a 600+ tome on the history of spaceflight have likely already read the Apollo-era story many times elsewhere; I found “the middle bit” the hardest to sustain interest through. Burrows redeems himself by giving an exceptionally enjoyable and thorough treatment of robotic scientific missions in the 70s and beyond, especially planetary. As with many survey histories, TNO suffers a little by accelerating its pace and struggling to find coherent narratives around the decades leading up to its date of publication. Much of the 80s are spent discussing and criticizing SDI (no question where Burrows lands here); Challenger is covered but the subsequent evolution of EELVs is skimmed, and SEI, single stage to orbit / reusable launch vehicle initiatives barely mentioned … the narrative switches almost exclusively to space station and robotic science for the nineties, capped by an excursion into the first wave of breathless / heady “commercial” space mania of the late nineties. All interesting, but gapped and a little disorganized, but then, so where the 90s as far as spaceflight was concerned. Overall, I’d recommend this read, but ended up wishing Burrows had had the last 15 years under his belt to include as well. A good survey of spaceflight from the timeframe of about 1990-now has, I think, yet to be written. Preliminary 2012 data from the national General Social Survey have just been released, and if the numbers hold, they show an “all time high” for public support for space exploration program spending, with positive responses (“too little spending”) higher than at any point in the survey’s 40-year history, and negative responses (“too much spending”) lower than the post-Challenger and early Apollo periods. I can’t say enough good things about this book. Beautiful and inspirational, it has the reassuring feature that a book on foundational principles of design should be exceptionally well designed itself. Each principle gets a two page spread with just the right depth of summary, narrative and citations on one side, and exceptionally well chosen examples on the other. The principles bridge graphic design, industrial design and engineering and can greatly aid building a common language of design and better understanding and collaboration in organizations which contain these often not-well-married communities. While the principles themselves might range from pithy to thought provoking, the overall ensemble is very rewarding. As with some others on Goodreads, I found this book a little hard to rate, thinking it a “3.5” and opting for a 4 star rating from an “E for Effort” standpoint. Part of this is high expectations on my part based on affinity for Silver’s FiveThirtyEight election prediction work. The book is well researched and covers a nicely diverse array of example topics, including but not limited to economics, betting, sports, weather, climate, earthquakes and terrorism. The diversity keeps the interest going. A challenge here is that few of the examples were unfamiliar to me; ironically as the book is ultimately about Bayesian inference, there may be a little bit of a Bayesian thing going on relative to those most likely to buy/read and those most likely to have prior exposure and be left wanting more. The same thinking might suggest that the book is targeted more towards readers attracted by Silver’s political forecasts than those with a wonkish or professional interest in prediction itself. For the latter, Silver redeems by offering something hard to find in similar popular literature, a high level synthesis across both realms and disciplines in prediction. A contrast with Kahneman’s Thinking, Fast and Slow and Surowiecki’s The Wisdom of Crowds (both of which Silver draws from) helps illustrate: While these two books are by no means peers (Kahneman’s represents a lifetime of scholarship, Surowiecki’s is more management faddish), as books, both suffer a bit from “the curse of knowledge” – the authors’ over familiarity with the often contradictory details leaves the reader rudderless on how to apply the findings in practice. Silver, instead, takes a first step towards synthesis. This is welcome, although occasionally questions do arise about the formal correctness of mixing and matching themes and findings from very the different predictive methods (regression, classification, physics based modeling, simulation, etc) covered in the book. Absent a unifying framework to relate these methods (Silver is clearly an applied forecaster rather than a theoretician) the reader must rely on his claims to authority by experience (as well as the depth of research indicated by heavy citation) in trusting the synthesis and recommendations. Overall, Silver ends up on the positive side of the trust ledger sheet, and even for readers already familiar with the topical examples, he provides enough additional color, as well as thought provoking commentary, to make it all worthwhile. Wow! This book is not only beautiful but really interesting. Far more than just a nostalgia coffee-table piece, the text is both interesting and thought-provoking. I found the best chapters / collections to be those on the human form, and on modern art influences. In these not only were the graphics themselves stunning, but the narrative added significant depth. I was a smidge less interested in the chapters that spent more time writing about technical details – the content seemed too deep for a non-aerospace reader, but “already known” for insiders. A surprising side to this book was how many of the advertisements are focused on recruiting, reflecting the early space age ramp up. To this end the ad copy itself is often very interesting as well. I gather the author is hard at work on another book. Can’t wait! Jon Gertner’s “The Idea Factory” tells an important story about the history of many of the communications and information technology underpinnings of our current era. More importantly, it explores (indirectly and eventually) a major question of what is needed to make large basic and applied research labs successful. I’m glad I read this book, but can’t say I necessarily enjoyed reading it. As such I’m struggling with whether to rate 3 or 4 stars … if Goodreads allowed 3.5, that’d be it. It probably takes a special sort of person to dive into an entire book about one statistical theory, but for those so-motivated, this one pays off. Pausing for a “work meets play” moment, thanks to stumbling across the cool interactive timeline tools at tiki-toki.com. 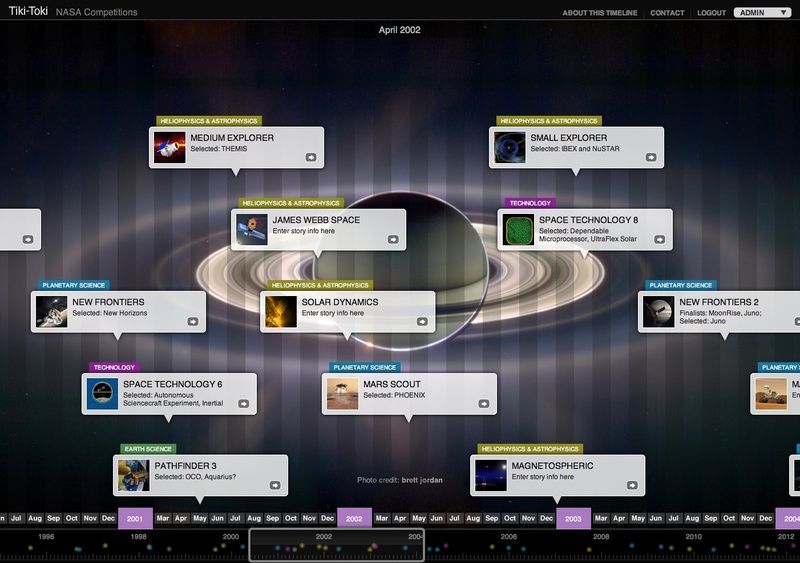 To try out the new tool, I loaded up a database of NASA mission proposal competitions over the last 20 years, mostly in science and technology. The dry run is available here. (Or view a screencap here). Time for one last slice of the NASA pie, this time broken out state by state (following up on previous slices by Company, and by Field Center). Again, all data are from NASA’s annual procurement reports, are inflation-adjusted to FY10 dollars, and are 3-year smoothed. The embedded time-series begin in 1999 (reflecting a 1997-1999 average) and end in 2010 (thus, the data still only reflect the old Constellation program, and not the Obama administration’s requested new direction). The threads that link the blog posts here together are tenuous: my interests in systems of all types (both people and technical), data, data, data, and more data, and design.